A picture is worth a thousand words, and like the famous image of a single Chinese man standing in front of a tank in Tiananmen Square, in politics, the power of a single image can rally people for a cause. Unfortunately in Burma, which is ruled by, perhaps, the most repressive dictatorial military regime in the world, journalists are not allowed into the country and anyone taking pictures with a camera are quickly imprisoned. So with its citizens shut in and the world shut out, very little is known of the atrocities in the country. 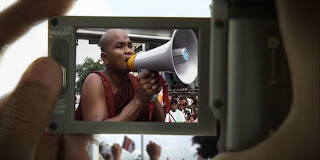 Anders Ostergaard’s intense and powerful documentary shows us the actions of a secret revolutionary media organization called the Democratic Voice of Burma (DVB), a group of courageous and righteous dissidents with pocket-sized video cameras who seek to export to the world video evidence of the repressive regime. We’re told at the outset that for the safety of the journalists, their identities cannot be shown. And so we can only watch our heroes in shadow and sihouette as they go about their secret covert work. They communicate with each other via VOIP and cell phones under fake identities, so as to avoid the prying ears of the military generals. It’s low tech spy games, with real world stakes of life and death. It’s September 2007 and there’s a distinct revolutionary fervour in Rangoon (the city’s capital). It’s been 19 years since its citizens protested against the regime, the result of which was swift military action and 3000 dead civilians. The VJs catch wind of a march by a group of monks in the streets to the home of their imprisoned leader, Aung San Suu Kyi. There are plain clothes military everywhere and being caught with a camera means imprisonment. Using the grainy, shakey cameras of the VJs, orchestrated by our hero referred to as 'Joshua', the journalists seek to capture contraband footage under the noses of the authorities. They are told to keep the cameras rolling, whether it’s in their pockets, under their arms, or even zipped up in their bag, any piece of video, or sound recording will help the cause. The march on Rangoon, featuring hundreds of orange-clad monks surrounded by thousands more motivated citizens makes for inspired visuals and supremely cinematic moments. We’re reminded of the great humanitarian protests in China, unfortunately without the prevalence of worldwide TV news crews. The footage eventually does get beamed out of the country to its immediate hub, Norway, and then out to CNN, BBC and the rest of the world. And when the military strikes back, many of the monks and VJs who have been risking their lives for freedom are captured and taken away in trucks, likely never to be seen again. Hopefully, a film like this will increase the international awareness of the atrocities in Burma, and like China and Tibet, create a more concerted worldwide movement to protect these journalists and eventually lobby for a free, democratic government. “Burma VJ: Reporting from a Closed Country” showcases best the power of cinema and importance of the recorded image in politics. Look for this film to make a serious contender come Oscar time, next year.